It’s a popular topic on gossip and entertainment news sites: Which big star might be losing his or her hair and which celebrities may have received hair transplants? Web sites such as Buzzfeed post before and after photos of celebrities they’ve suspected of having transplant procedures. British tabloids publish stories about the latest star to have a transplant. We hear speculation that A-listers like Matthew McConaughey, John Travolta, and Kim Kardashian may have received hair transplants. News involving the rich and famous almost always build an audience, and paparazzi photos pick up every change in a celebrity’s appearance. It’s natural for people to discuss what’s going on in Hollywood or other wealthy hot spots, but sometimes our celebrity obsessed culture can distort what’s really happening. It may seem sometimes like hair transplants are only for the rich and famous. But in fact, they’re for everyone who is looking for a permanent solution to hair loss and thinning hair. 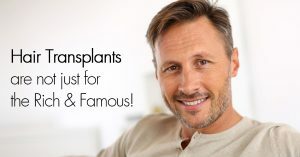 RHRLI wants you to know that our state-of-the-art robotic hair restoration procedure using the ARTAS® system can help you, and that hair transplants are not just for the rich and famous. So who does get hair transplants? The International Society of Hair Restoration Surgery keeps statistics on hair transplant patients. They published their most recent survey in 2015. That study found that 84.7 percent of surgical patients seeking a solution for hair loss were men and 15.3 percent were women. In all, there were 358,109 surgical patients worldwide with 112,409 patients in the United States alone. Hair transplant procedures are very common in Asia where there are 143,239 patients but were less so in Europe, which saw 46,849 surgical patients. About $2.5 billion in U.S. dollars were spent on hair transplant procedures. Since the survey came out, one country that has seen hair transplants grow substantially is Turkey. According to the college magazine website Alverno Alpha, thousands of Americans and Europeans travel to Turkey every month to receive hair transplants. It pumps nearly $1 billion into the Turkish economy. Transplants have existed since 1950, and have changed over the years. There are also different types of procedures. The ARTAS® system is the most advanced hair restoration treatment you can find. It is a Robotic Follicular Unit Extraction (RFUE) procedure that provides precision, speed, and accuracy to give you a healthy, natural looking head of hair. Using the ARTAS® system, your doctor will find which donor hairs are most suitable to be transplanted. Through the use of robotic technology, we’ll harvest the donor hairs with more precision than other procedures involving hand-held devices. The donor hairs will then be moved to areas where you’ve lost your hair. You’ll have a quicker recovery time compared to other procedures like strip surgery because we won’t use scalpels and you won’t need stitches. Nor will you need a strong medication after the treatment is over. RHRLI is the only hair restoration treatment center on Long Island that uses the ARTAS® system. We can start you on the road to a permanent solution to your hair loss and you don’t have to be a celebrity. To discuss your treatment options, contact RHRLI today.